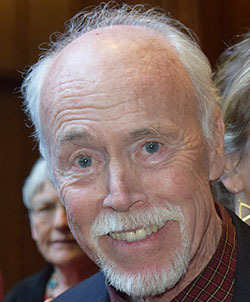 Karl Hedrick, UC Berkeley professor of mechanical engineering and James Marshall Wells academic chair, died Feb. 22 from lung cancer. He was 72. Hedrick’s research focused primarily on nonlinear control, automotive control systems and aircraft control. His most famous work was in regards to the autonomous car, a car that senses its surroundings and can navigate traffic without direct control by the driver. In the 1980s, Hedrick was the first to test the automated car on the highway, according to Francesco Borrelli, campus professor of mechanical engineering and fellow co-director of the Hyundai Center of Excellence in Integrated Vehicle Safety Systems and Control. In addition to his work with the Hyundai Center, Hedrick held a variety of appointments throughout his career, including chair of the UC Berkeley department of mechanical engineering from 1999-2004 and director of the Partners for Advanced Transit and Highways Program on campus from 1997-2003. Hedrick completed his bachelor’s degree in engineering mechanics at the University of Michigan, and his master’s and doctorate in aeronautical and astronautical engineering at Stanford University. In 1970, Hedrick began his career in academia at Arizona State University as an assistant professor of mechanical and aerospace engineering, and then became an associate professor of mechanical engineering at the Massachusetts Institute of Technology in 1974. In 1988, Hedrick was recruited to UC Berkeley where he worked until his death. Hedrick received numerous honors during his lifetime, most notably his 2014 induction into the National Academy of Engineering, the highest honor awarded to an engineering professor or industry leader. Hedrick was a competitive tennis player, according to his friends and colleagues. While he was a student at Stanford, Hedrick played for the campus’s tennis team. Hedrick also had a competitive nature off the tennis court, Horowitz said. Once during a faculty retreat, Hedrick and his colleagues had a breath-holding competition. Hedrick beat Horowitz, a swimmer, by an entire minute. In spite of his competitive nature, Hedrick’s peers saw him as easygoing. Andrew Packard, a campus professor of mechanical engineering and a close friend of Hedrick’s, described him as not only a good mentor of students, but of young faculty, too. Hedrick left behind a legacy of over 70 doctoral graduates who now work at companies such as Tesla and Google. Contact Ella Jensen at [email protected] and follow her on Twitter at @ellajensen_dc.